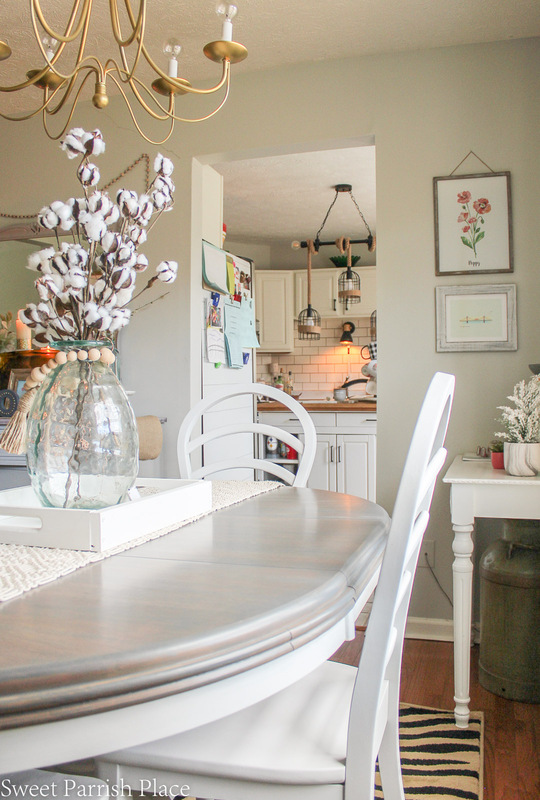 This weathered grey dining table makeover shows you how to take a beat up dining table and give it a fresh new finish. This tutorial shows you how. Hey girl hey! 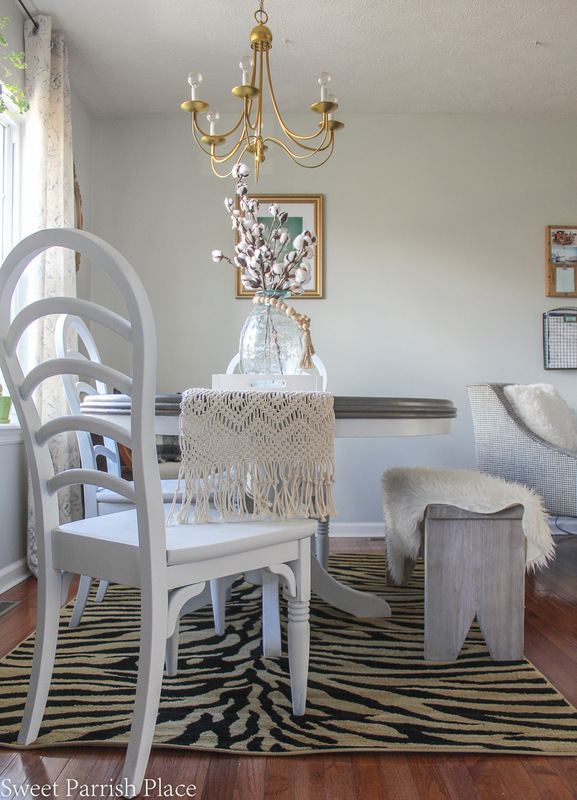 If you follow me on Instagram, you may have noticed that I have been a bit obsessed with sharing photos of our recent dining room/office refresh that we finished for the $100 Room Challenge. 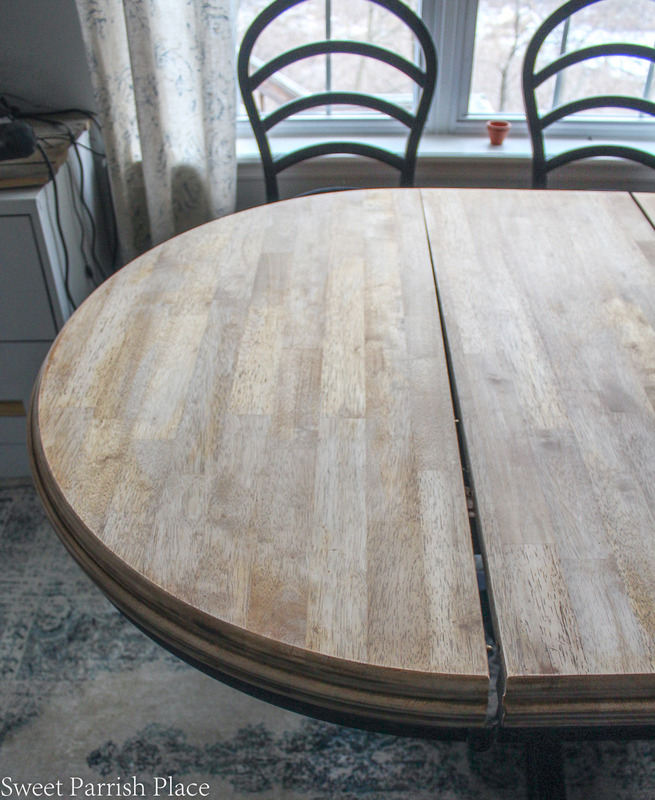 One of the major projects I completed for the refresh was to make over our beat up, sad dining table. This project cost only a little money, but it took quite a bit of time to complete. But it was totally worth every second I spent on it because it literally looks like a brand new table now! 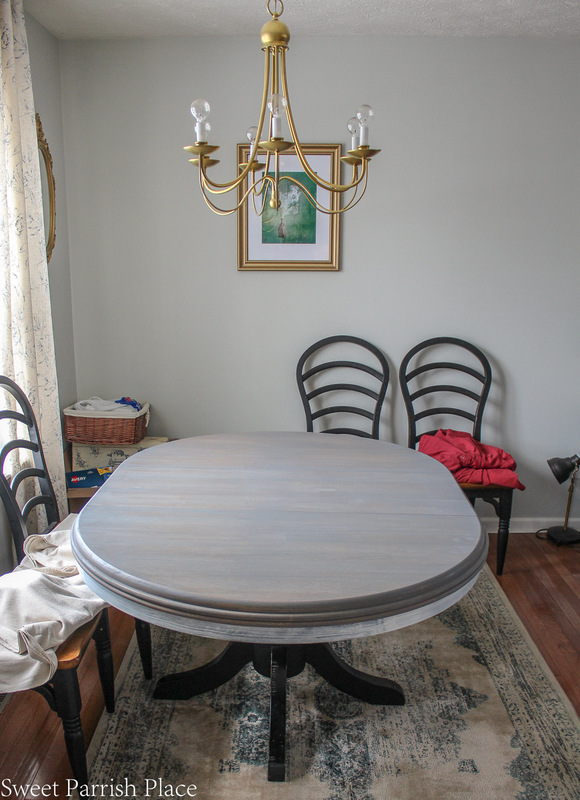 I am so glad that we opted to do this weathered grey dining table makeover, rather than to sell this table and chairs and purchase new ones. Especially because the size and shape of this table work well in this particular space. Before we get started on this tutorial, I have to share a before photo of this table. So, here it is! To be honest, it doesn’t look that bad in these photos because I always took strategic photos and edited so that you couldn’t really tell what bad shape the table was in. 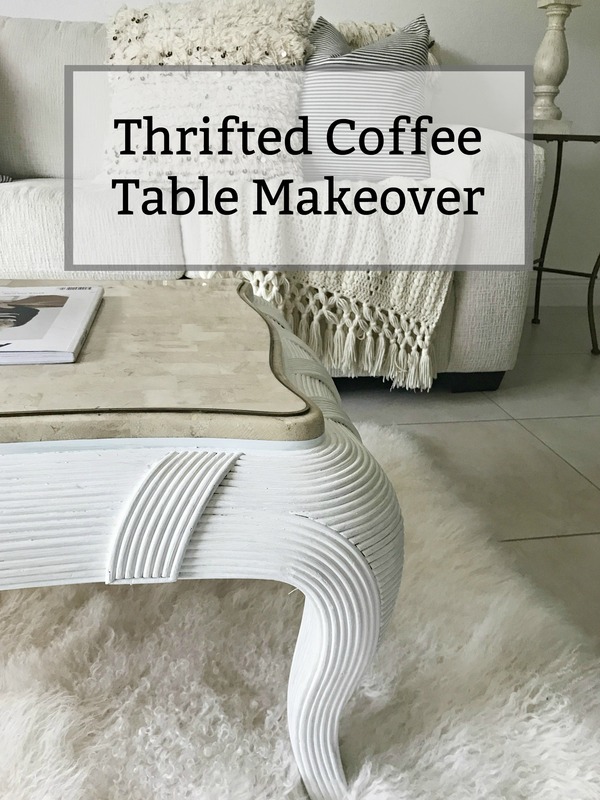 You can go to my Instagram Story highlights and find video of this dining table makeover, and in those videos, you can definitely see the damage that was done to this table. 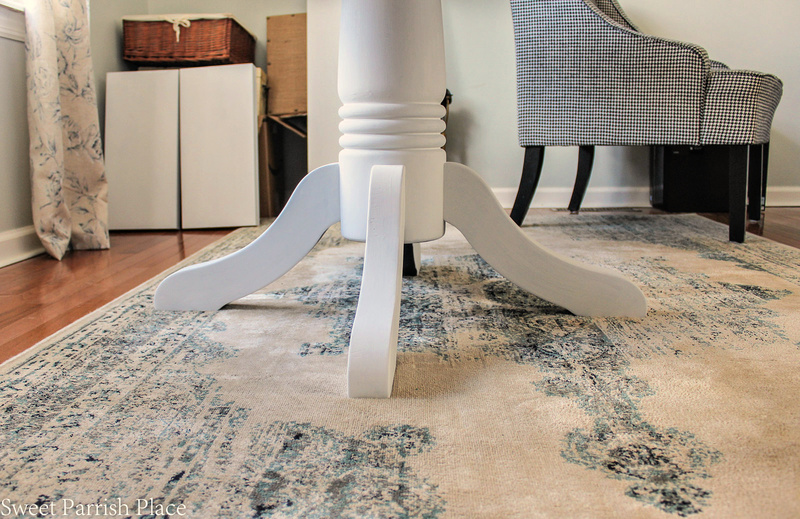 It is saved to my story highlights under dining table makeover. This table is about 13 years old, and I purchased it from a very nice local furniture store. I loved it at the time, but I feel like it just looked dated with the color of the stain on top and the black base. 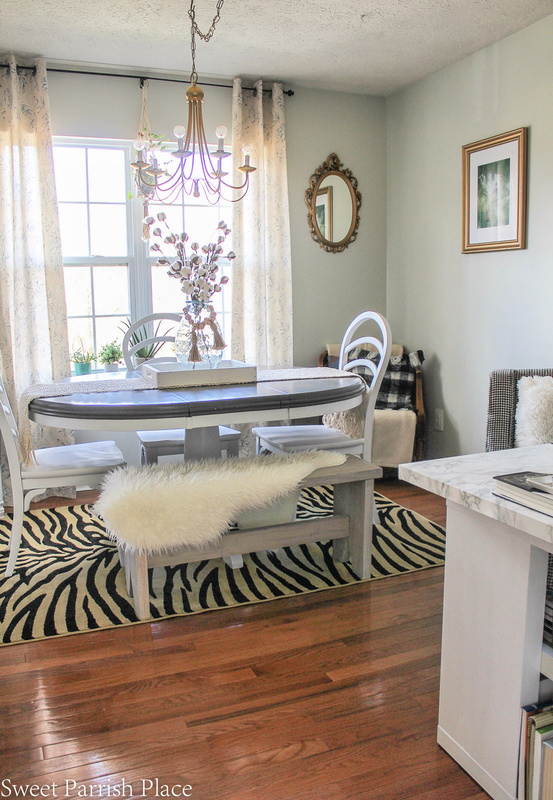 I really wanted to lighten everything in this room up, and I started with the table. 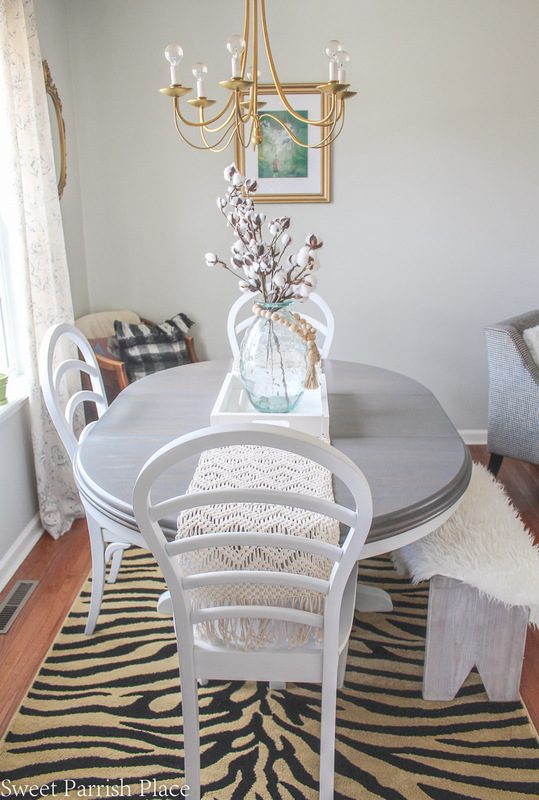 First off, I took to Pinterest to find some inspiration, and I found this table below that Lauren from Bless’er House did a couple of years ago, and I used this photo and her blog post for inspiration for our weathered grey dining table makeover. Her table base is very similar to mine, don’t you think? 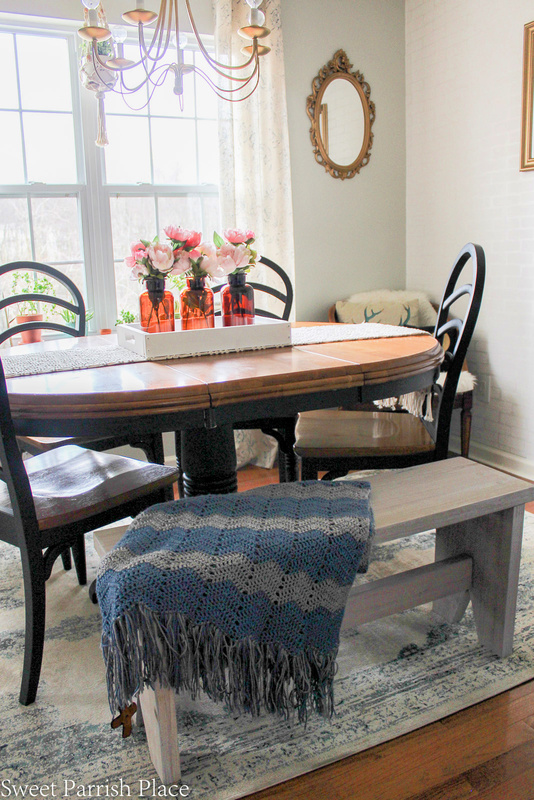 Keep reading to see more photos of our weathered grey dining table makeover, and to see the full tutorial on this project. I started by using Citristrip to remove the varnish off of the table top. All you do is paint it on, let it sit for anywhere between 30 minutes to 24 hours. I opted to paint it on one evening and let it sit overnight. Here is where I made a mistake, so if you are going to use Citristrip, you want to read this part carefully. You won’t find this on the back of the bottle. As I said, I painted it on one evening, and then I left it sitting over night. When I woke up, I went to start scraping the finish off, but it was completely dry, and I was unable to do so. Therefore, I had to paint more product onto the table. This was a waste of the product. It turned out alright and after I painted more product on the surface, and it was wet again, the varnish stripped right off with my plastic paint scraper. Afterwards, I found a post on Pinterest that said if you are going to leave it sit, you need to cover it with plastic wrap. So, if you decide to leave it sit overnight, you should probably cover it with plastic wrap so it won’t dry out. When you are scraping the Citristrip, you will need to use a plastic scraper so as not to damage the wood on the table. Also, make sure you are scraping along with the grain of the wood, not against the grain. I scraped all of the gook off into a paint pan covered with aluminum foil. I then was able to just gather up the foil and throw all of that away. The Citristrip did a great job of removing the varnish from my table. Because the edges all around this table were rounded like they are, it took a little extra elbow grease to remove the finish. I used a non scratch scrub pad to get down into the little nooks and crannies. After I was finished, I wiped down the table with a wet rag and waited for it to dry. Next, I broke out my hand held sander and sanded the rest of the stain off of the table. I would say I sanded it for about an hour before it looked like this. FYI, our dining room had a layer of sanding dust after it was all over, but it was nothing a vacuum and duster couldn’t fix. With it being mid winter, we were not moving this table out of the room. Can I just tell you how satisfying it was to see this table stripped down to the natural wood? I loved it so much, that even now, there is a small part of me that wishes I had left it like that and given it a few coats of Polycrylic, and called it a day. Of course, I would have still painted everything else but the table top white. Once the table top was dry, I began staining it with the Varathane weathered gray stain. 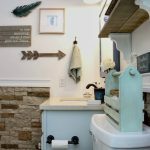 This is a good juncture to let you know that in my inspiration photo above from Bless’er House, she used Minwax Weathered Oak Stain. I went to Home Depot to find that exact stain, and was very disappointed to find out that Home Depot no longer sells Minwax products. And being the lazy girl that I am, I did not want to go to another store. So I chose to purchase the Varathane in weathered gray instead. The guy at Home Depot told me it should be very similar in color. So, I went for it. But after seeing the finished product compared to the table Lauren finished at Bless’er House, I would disagree that the two products look the same. I still prefer the finish Lauren achieved, but I have made my peace with it. And some people may prefer the look of the stain I used. It’s all personal preference. I worked in 6 sections by brushing on the stain with a brush on a 6th of the tabletop, waiting a minute, and wiping back using a clean rag. Then, I’d move on to the next section. At first I tried doing a larger section before wiping it back, but I wasn’t happy with the result, so I started brushing and wiping in smaller sections. I applied two coats of the stain, following the directions on the back of the can. And below is the top of the table after I finished applying and wiping. Afterwards, I let it dry and cure for several days while I worked on painting the base of the table and the chairs. Once I got back to the table top, I lightly sanded it to a smooth finish, then I gave it 5 light coats of the Minwax Polycrylic in clear matte. I lightly sanded the table with a fine grit sanding sheet in between every other coat. I decided to give it 5 coats because this table is in a high traffic area and gets a lot of wear and tear. Especially from our dog, who likes to put his paws around the edges of the table. 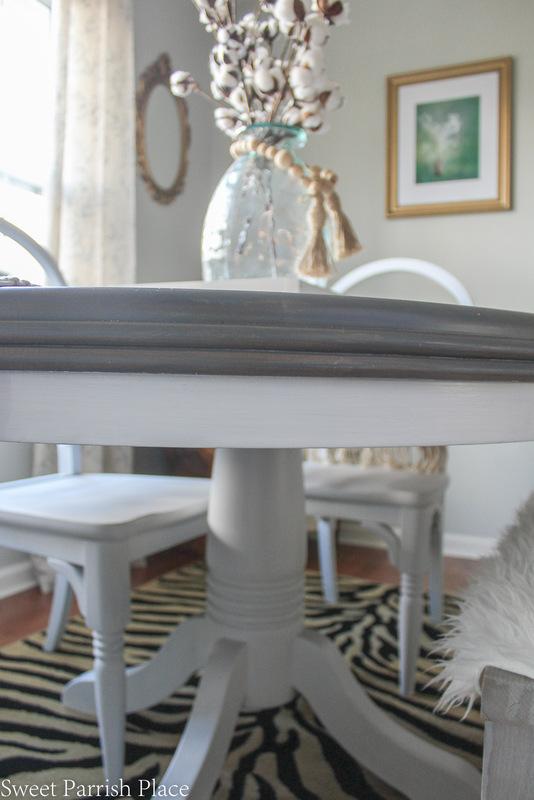 I ended up painting the base of the table and the chairs with Rustoleum Chalked paint in linen white. I did wipe the base and chairs down with a liquid deglosser first, and let it dry. This is as simple as wiping it down with a rag, and then wiping it down again with a clean wet rag until all of the deglosser is removed. Then you let it dry. I painted the base of the table and the apron of the table using a slanted brush. The table base took two coats of paint. 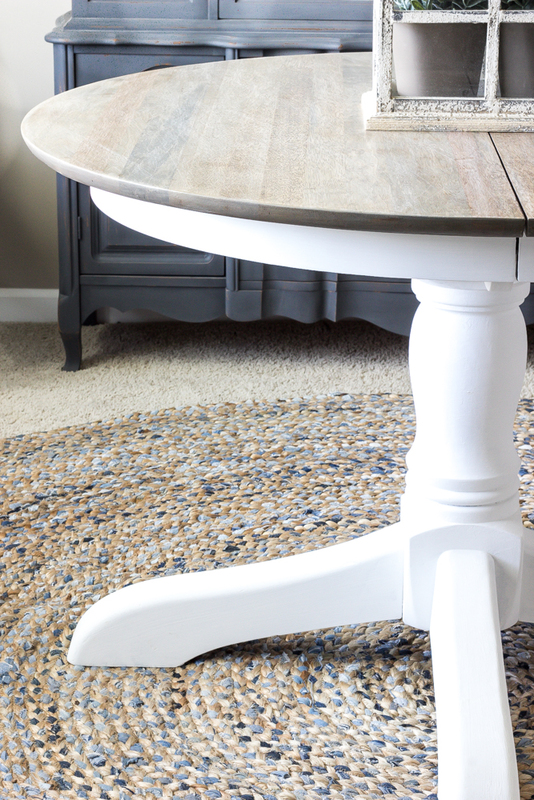 I cannot tell you what a difference it made to see this table base go from black to white. I’m so so happy with how it turned out! After the paint was completely dry, I gave it two coats of the Minwax Polycrylic I used to seal the table top. Because this is a heavily used piece of furniture, I opted to use the polycrylic instead of waxing the table base. I felt like this will be a little more durable. 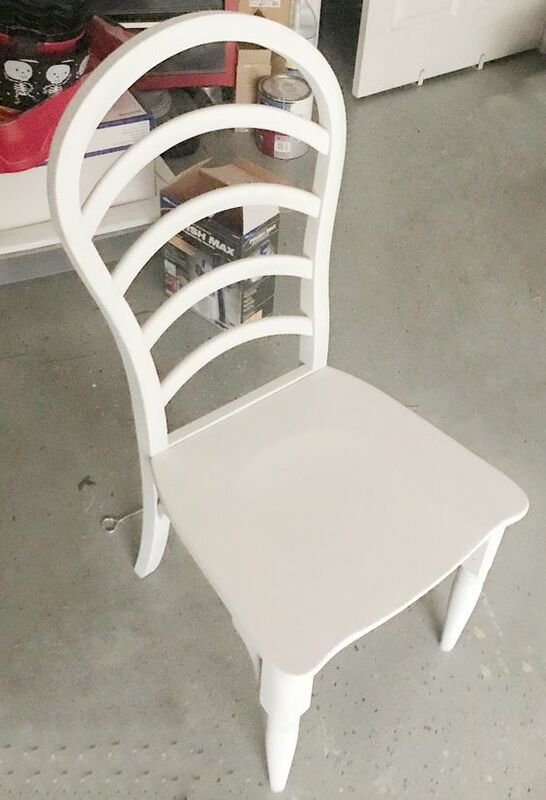 I opted to use my Homeright paint sprayer to paint the chairs. I just felt like it would be easier than trying to paint them with a paint brush. So I took them down to the garage so that I could paint them. I wiped the chairs down first and gave them a good cleaning. 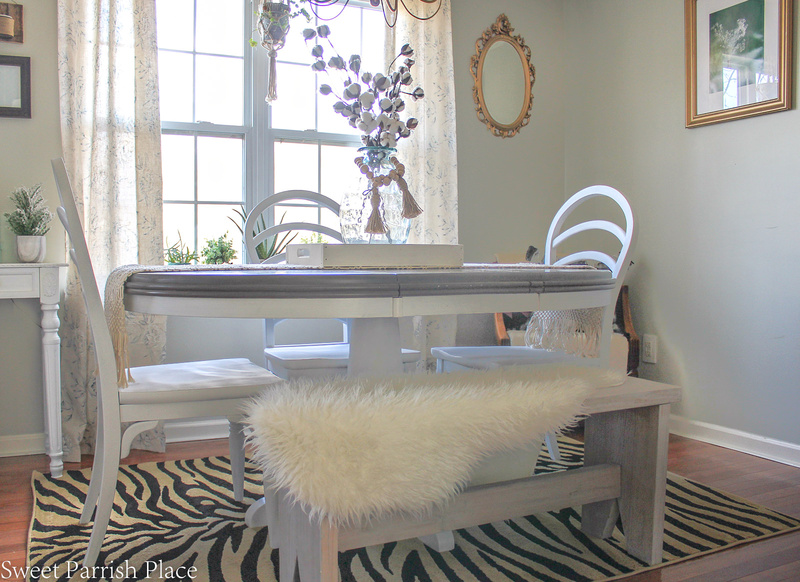 I actually used a couple of cans of matte white spray paint that I had on hand, and primed the chairs with that. I was doing this project on a budget, and I wanted to use something I had on hand. I also didn’t want to put a primer in my paint sprayer and then have to switch it out to chalk paint. That would have been kind of a hassle. I gave the chairs several light coats of chalk paint with my paint sprayer. Note that if you are using chalk paint in this particular sprayer that I have, you will have to thin the paint out with water first. Consult the owners manual for how much to thin out different types of paint. After the chairs were painted and dry, I lightly sanded them with a fine grit sand paper until they felt smooth to the touch. I then used the Rust-Oleum Painter’s Touch Multi Purpose Spray Paint in Matte Clear and gave the chairs 3 lights coats to seal them. I was working on the chairs in our garage, which is not well lit. And it was freezing outside so I was unable to open the doors. Once I brought the chairs back upstairs, I noticed some spots that need touched up. I will easily be able to touch them up a bit with a paint brush and then some of the Polycrylic I used to seal the table top. I am really proud that I was able to give this table and chairs a new life all on my own! Initially, I was fretting over the table top being a little darker than I had wanted it to be. But once the table base and chairs were finished, I decided I was happy with the color of the table top. It is definitely a HUGE improvement and something that I can live with. Below, I am sharing some more shots of the finished product. This next shot is a good depiction of what the table top actually looks like during daylight hours. It looks a little darker when it becomes dark at night. You definitely can still see the natural wood grain shining through, which I wanted. since this project has been completed for a few weeks now, I have since went and purchased some place mats to use for every day use on this table to try to protect it as much as possible, because I think I might cry at the first scratch or sign of use! I’m trying to brace myself because I just know one day it will happen. 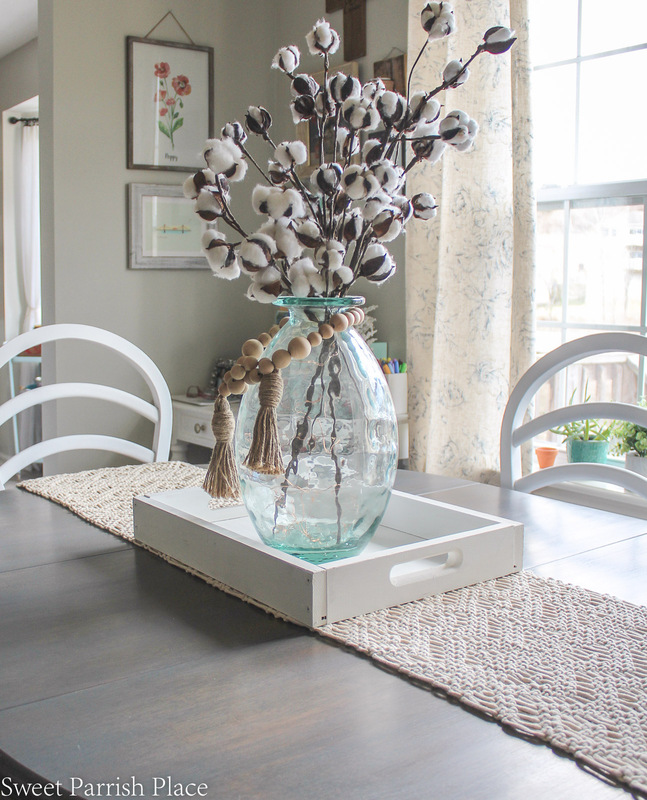 I styled this table top really simply with a pretty macrame table runner and a white wood tray with a simple aqua glass vase and some cotton stems. I wanted the pretty table top to be front and center. 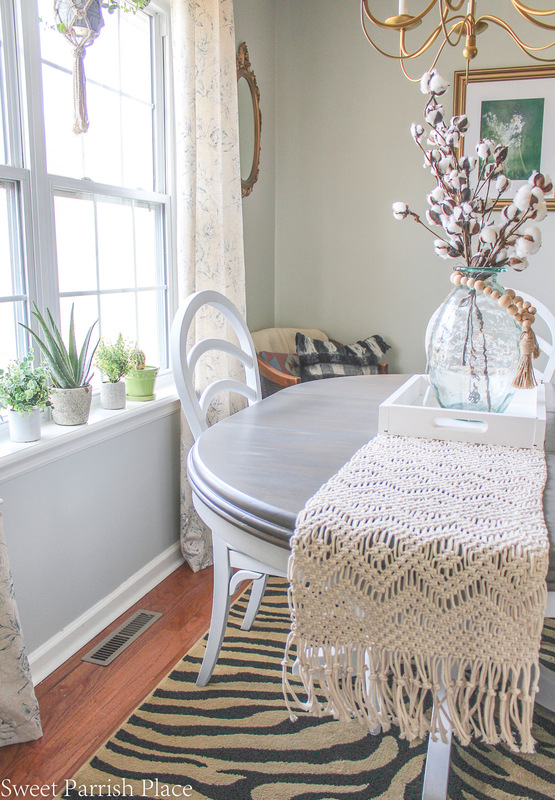 I just can’t tell you how happy I am about how this table and chairs turned out! We will for sure be using this ding table for years to come now. Thanks to each of you for stopping by today! 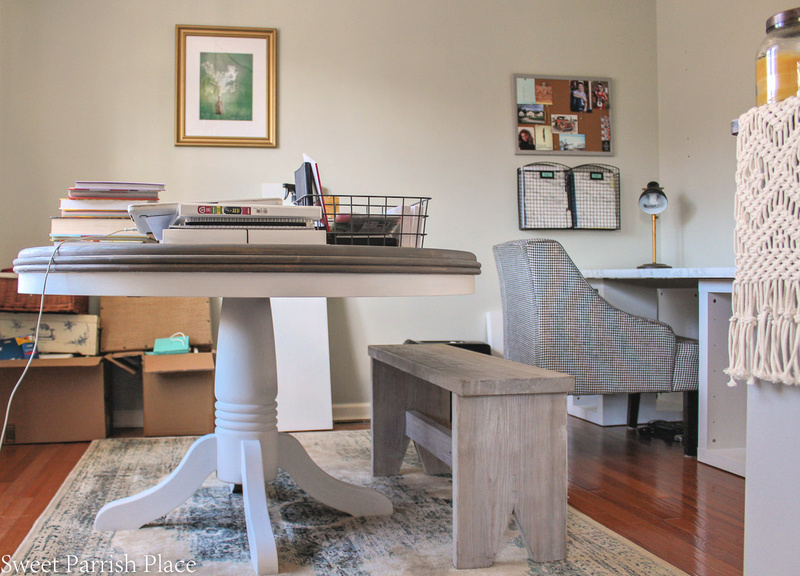 I hope I inspired you to try to refinish a piece of furniture you already own today. 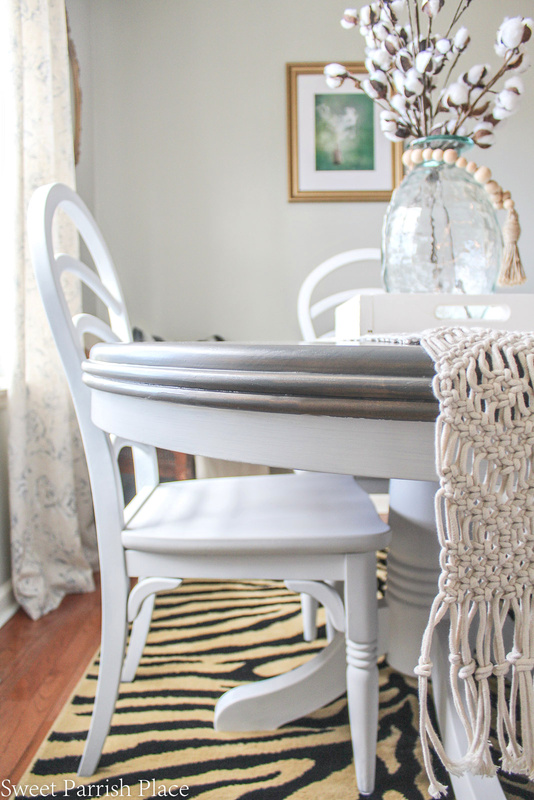 There was a time I would have never attempted this sort of dining table makeover. But I am so happy that I gave it a shot! 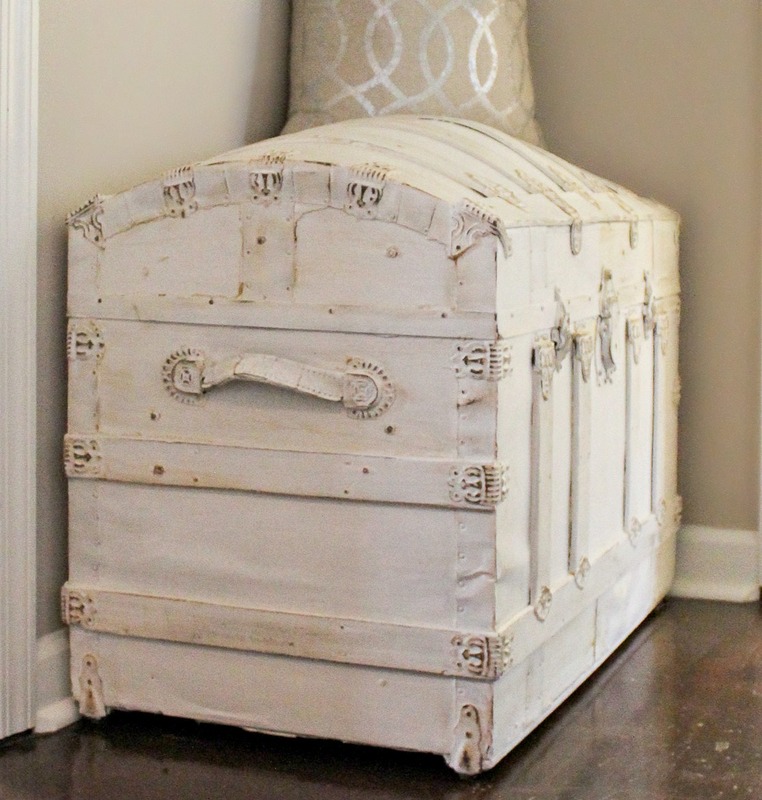 What piece of furniture do you own that you would like to makeover? Please share with me in the comments. I love your comments and read every single one! The table looks beautiful. Great job! I love the colors. 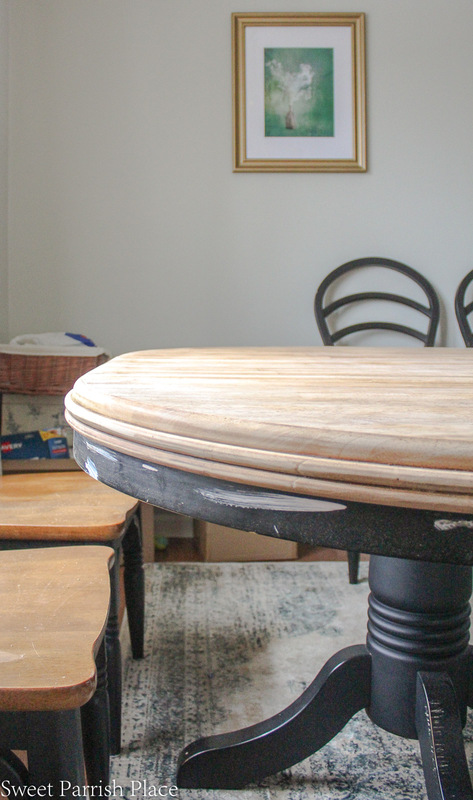 I plan to refinish my dining room table someday… maybe when my kids stop abusing it! I know what you mean Jena! Two of my children are out of the house, and our youngest is 11, so we are over that stage. But then we do have a dog who likes to destroy things, so it’s always something! Thanks so much! 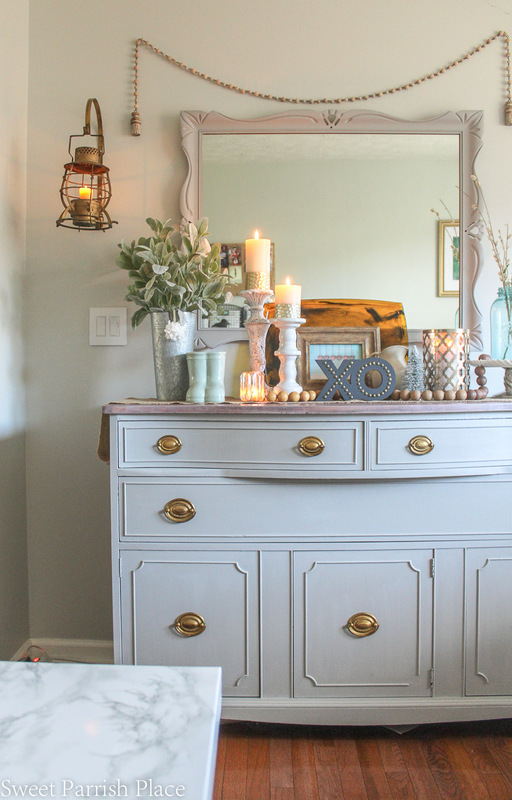 This is a beautiful makeover!! 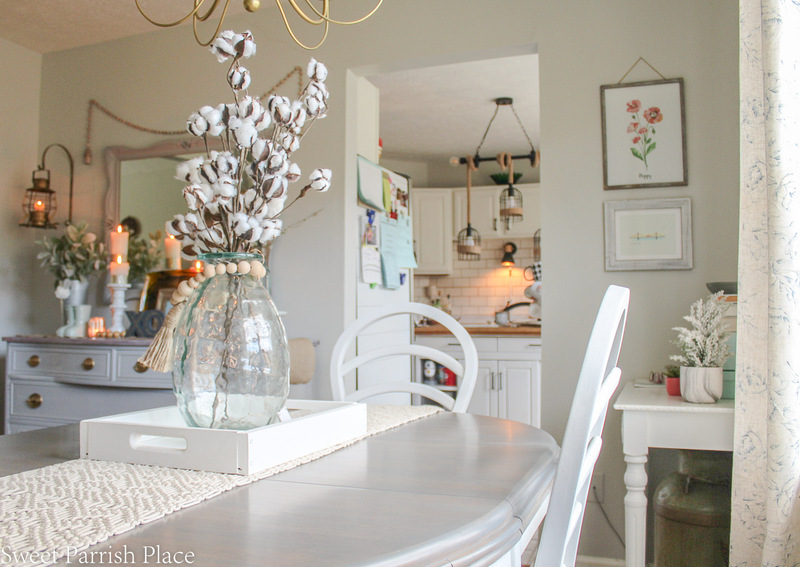 I am so glad I found your post because I have been thinking quite a bit about my dining room table as well. I love to know what finish people are using for a piece of furniture that will get a lot of use. I can’t stand when I paint something just to see it chipping, ugh. And that is definitely what I don’t want for my dining room.!! Thanks for the info; very helpful. pinning:) Saw your post at the share your style party! Hi Kathleen! Thank you so much! I did a lot of research before making this table over. I have my fingers crossed that it will last for years!